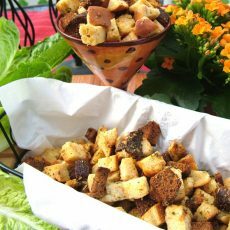 These croutons are super easy to make and so delicious. Have you ever gotten too carried away with buying bread on sale or in bulk only to find out it’s not being used before the pull date or before it goes bad? When this happens to me I’ve tried freezing it but it just doesn’t seem to taste as fresh after that, and it takes up a lot of room in the freezer. 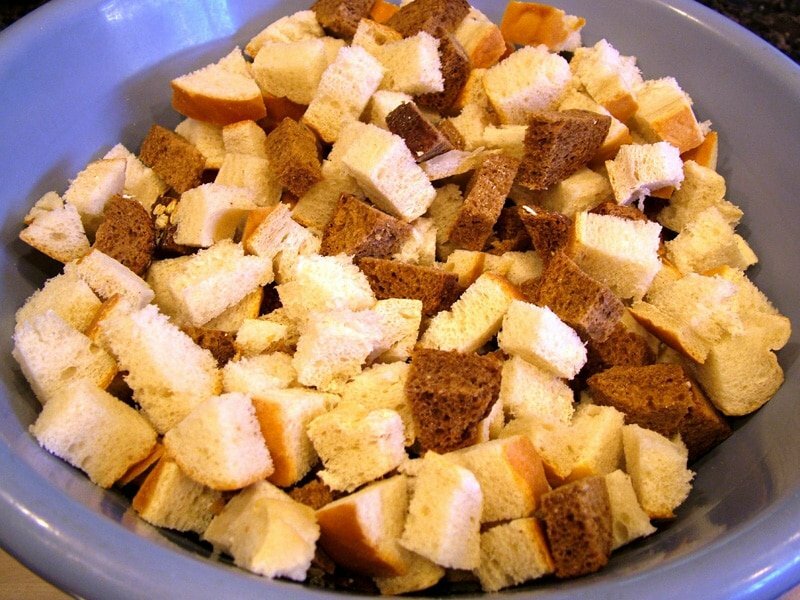 Here’s a great way to use leftover bread and have a homemade treat at the same time. They store great in a big Ziploc bag and are delish in salads, soups, or as a snack. 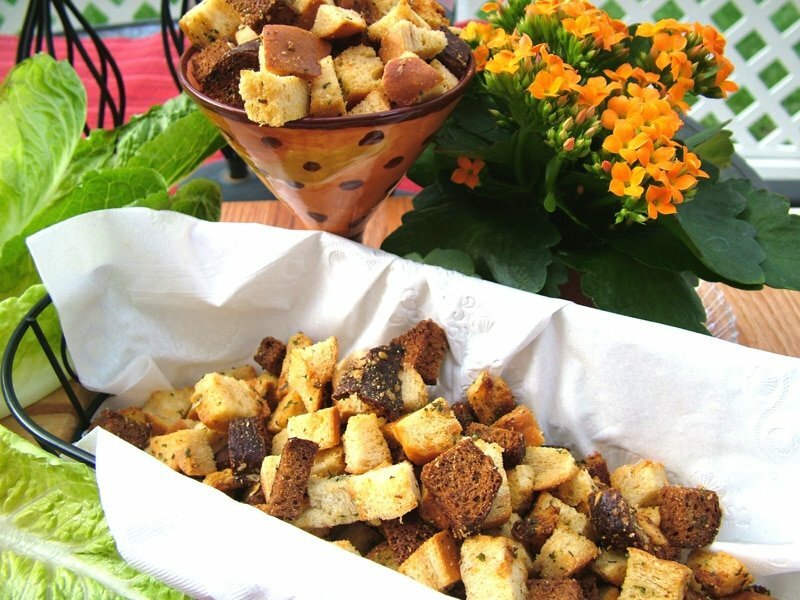 You can be creative and use any type of bread with this recipe too. 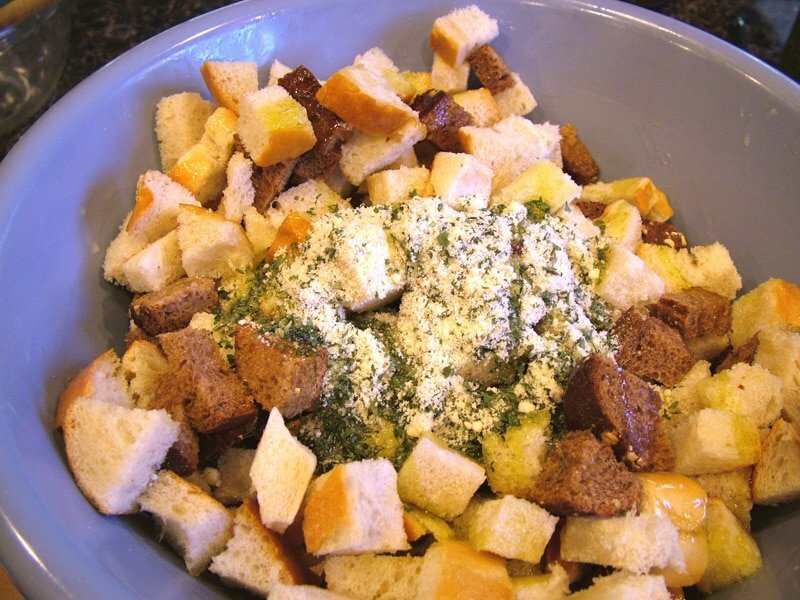 Bread, butter, dried parsley, garlic powder, fresh rosemary leaves, parmesan cheese, and olive oil. Cut the bread (crust and all) into one inch squares. Put them into a large bowl and set aside. Depending on the size of your bowl, you may need to make this recipe in two batches. Chop the rosemary leaves and leave out about 10 whole leaves. Set aside. 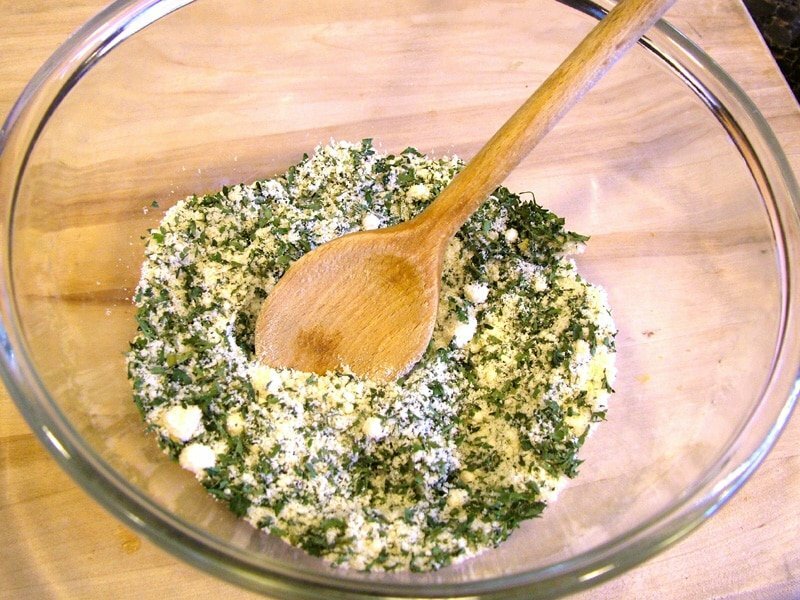 In a separate bowl mix together the chopped rosemary, parmesan cheese, garlic powder, dried parsley and salt. In a separate small bowl add the butter and 10 or so rosemary leaves. 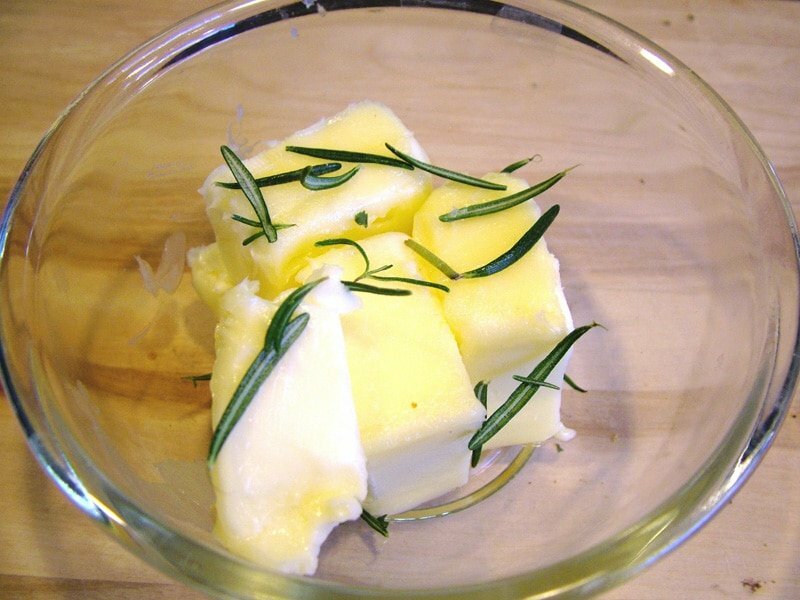 Melt the butter with the rosemary leaves in it. The microwave works well for this when using a glass bowl covered with a paper towel. 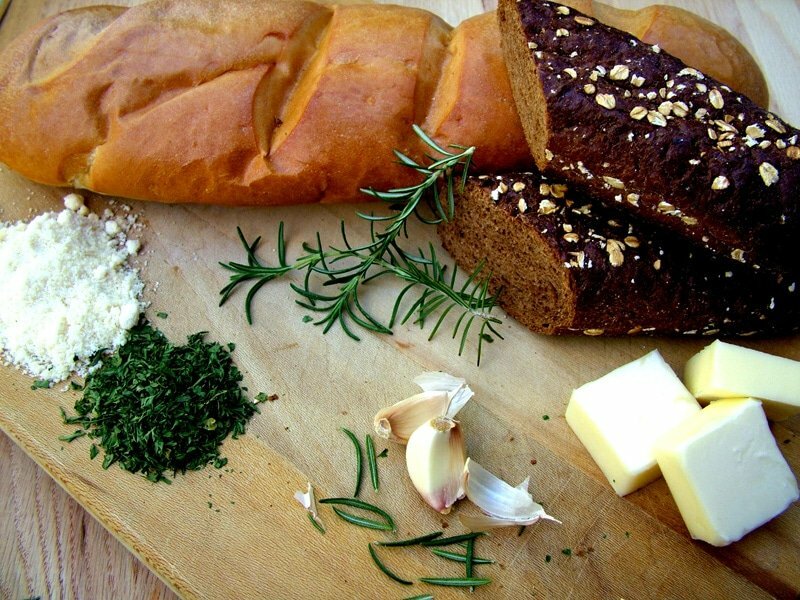 Drizzle the butter with the rosemary leaves over the bread and mix gently. Add the herb and parmesan mixture and gently mix. Put the bread onto a large cookie sheet making sure that it’s spread out evenly. Drizzle the olive oil on top of the bread. Bake in preheated oven for approximately 40 minutes. Occasionally move the bread around using a spatula. Then turn up the heat to 375 degrees F. for a few minutes. 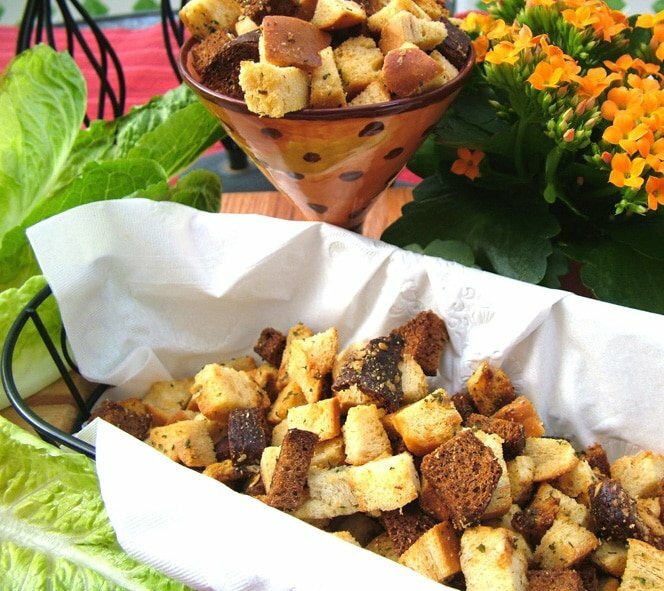 Just enough so that the croutons get slightly brown. Let cool before serving. Add to salad or soup. Or enjoy them as a snack. Preheat oven to 300 degrees F. Cut the bread (crust and all) into one inch squares. Put into a large bowl and set aside (depending on the size of your bowl, you may need to make this recipe in two batches). In a small bowl add the butter and 10 or so rosemary leaves. Melt the butter with the rosemary leaves in it. The microwave works well for this when using a glass bowl covered with a paper towel. 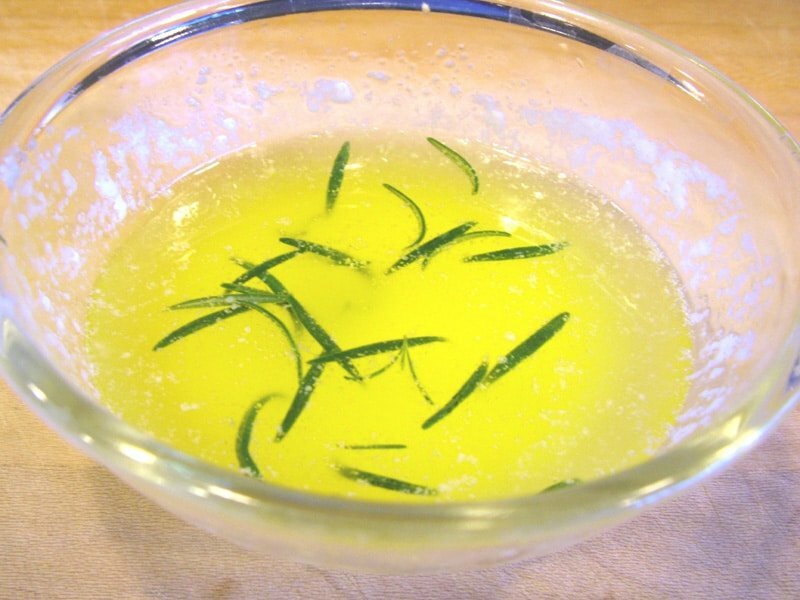 Drizzle the butter with the rosemary leaves over the bread and mix gently. Add the herb and parmesan mixture over the bread and gently mix. Add the bread onto a large cookie sheet making sure that the bread is spread out evenly. Drizzle the olive oil on top of the bread. Bake in preheated oven for approximately 40 minutes. Occasionally move the bread around using a spatula. Then turn up the heat to 375 degrees F. for a few minutes. 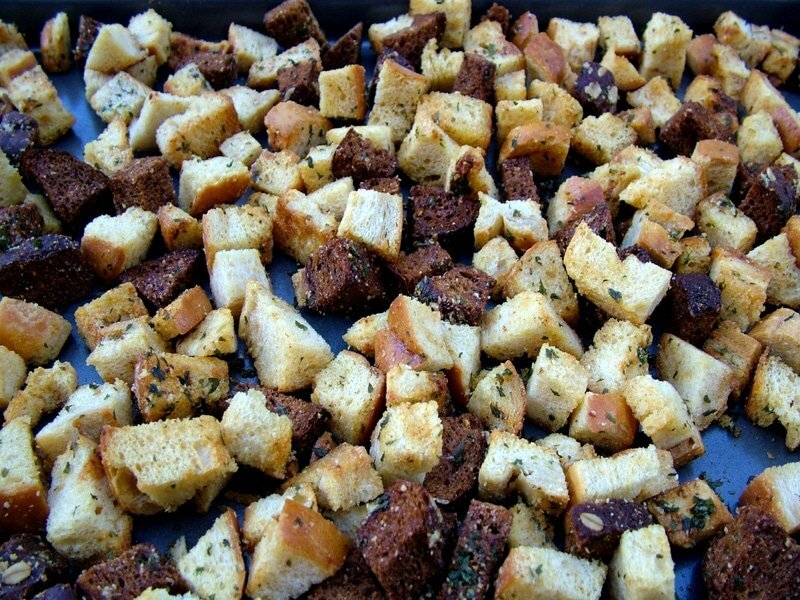 Just enough so that the croutons get slightly brown.